Vienna-based violinist Vira Zhuk and pianist Mariam Vardzelashvili are paying a musical homage to their current home Vienna, and their native Ukraine and Georgia. Let's get #onthemove together! Vienna has always been home to musicians from all over the globe, who came with the baggage of their own musical cultures and influences. 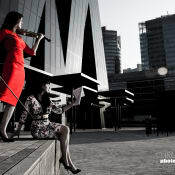 With the CD #onthemove, Ukrainian violinist Vira Zhuk and Georgian pianist Mariam Vardzelashvili will pay an homage to both, the city of Vienna and their homelands. The duo chose F. Schubert as the quintessential Viennese composer, who absorbed and re-worked the vocal city folklore. Two major works- his first big piece for violin and piano, the A major ’Grand Duo’ and the late monumental ’Fantasy’ show the full palette of Schubert’s expressive colors. A fine example of violin/piano repertoire is the ’Dedication’ by the living classic of Ukrainian music Y. Stankovych. As a young composer Stankovich embraced cutting edge and almost provocative compositional techniques of the time, only to return to tonal, lied-like melancholic musical language, echoing the nostalgic Ukrainian vocal folklore. E. Chabashvili is a prominent female Georgian composer of the young generation. Her style is poetic, theatrical and sits on the crossroads of different arts. Georgian performance scene has long been dominated by female musicians. A powerful woman composer fits naturally within the tradition. B. Gander has established himself as an important figure in the contemporary Austrian musical life with his powerful, dynamic and electric musical language. His music shows the modern, 21st century energy of Vienna, the power and the potential of the city. The ’Prophecy’ sounds almost as a semi-improvised live set of a hip DJ in a high-quality electronic music club. #onthemove is a unique blend of music from Vienna, Ukraine and Georgia. It expresses both the diversity and the unity of the three cultures and explores through music the modern-day phenomenon of constantly being #onthemove. We hope that we can get #onthemove together! This project ended successfully on 24/7/2018 10:00! You will receive a personalized postcard signed by us from one of our concert tour destinations. Be surprised by a card from a special (maybe even exotic) location! Get a signed concert poster from one of our past or upcoming performances. Be among the first people to receive the CD #onthemove before its official release. With our signatures and lots of positive energy, of course! You will get a signed copy of the CD, a concert poster and a small surprise gift from us! An individual lesson/coaching for either violin, piano or a chamber music group. In Vienna or per Skype. Would you like to host us for a house concert? Now is your chance to book a 45 minute long performance for your family and friends (or just yourself) with repertoire selections from our CD (a copy of #onthemove is included). Vienna area only. A full concert version performance of our CD with an additional work chosen by you. Exciting moderation with interesting information about each piece in English, German, French, Russian,Ukrainian and Georgian (a copy of the CD included). Not limited to Vienna area, travel costs not included. Violinist Vira Zhuk and pianist Mariam Vardzelashvili are two independent artists who created an intimate chamber music ensemble. The duo fascinates audiences with highly individual approach and fresh reading of the pieces and a vibrant stage presence. They are united by the idea of exploring and expanding the boundaries of the repertoire for violin and piano.